Last year – with two of three planned construction phases complete – Western Illinois University-Quad Cities (WIU-QC) had 1,531 students. On the surface, this looks pretty bad. There was no equivocation in that enrollment statement, and the numbers aren’t even close. But as the campus’ Fiscal Year 2015 report puts it: “Western Illinois University-Quad Cities is the fastest-growing Illinois public university for the last five years.” Ten of Illinois’ 13 public universities saw decreases in enrollment from fall 2010 to fall 2014 – from modest declines to alarming drops of more than 10 percent (for six universities). The head count at WIU-QC, meanwhile, jumped 11.9 percent – more than double the percentage increase for the next-best-performer, the University of Illinois at Springfield. 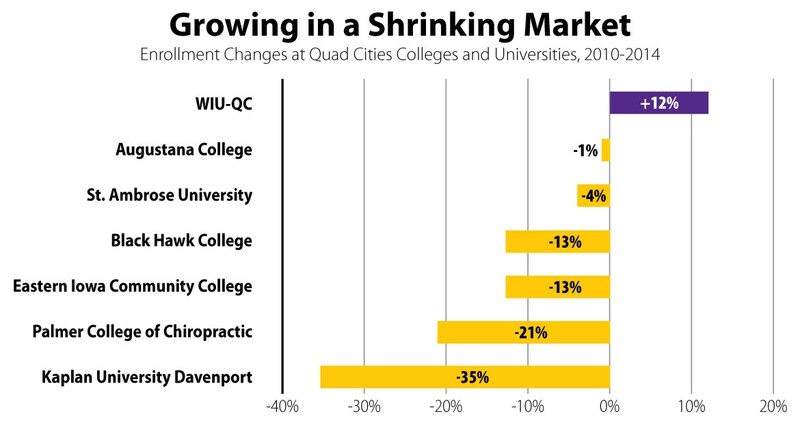 So the glass is probably half-full when it comes to WIU-QC, largely because its enrollment has been an exception to the exodus from college campuses nationwide over the past five years. WIU-QC’s riverfront campus currently has four buildings with nearly 155,000 square feet of space on 20 acres off Moline’s River Drive (north of Riverside Park in the eastern part of the city). It was built in two phases at a cost of nearly $60 million. The third construction phase is on hold – with $5 million in funding announced in 2014 under then-Governor Pat Quinn but currently frozen. That phase was estimated to cost almost $35 million. Rives said the four current buildings were designed to accommodate 3,000 students. Although WIU-QC is barely halfway to that target, the people interviewed for this article expressed little concern about the campus’ enrollment numbers. Tara Barney, president and CEO of the Quad Cities Chamber, echoed those sentiments, saying she is pleased with WIU-QC so far in terms of enhancing local higher education and as a “catalyst” for development along the Moline riverfront – including the The Mills at Riverbend Commons with apartments and a pair of restaurants just to the west of WIU-QC. Enrollment under the initial projection, she said, is a symptom of the challenges colleges and universities are facing nationwide. “The academic community is having to contract in many areas,” she said. “I don’t think it’s going to slow that campus” in the long run. In 2003, Deere donated the land on which the campus sits to Western Illinois University, and it has since donated $1 million to the Quad Cities campus – largely to support the College of Business & Technology. 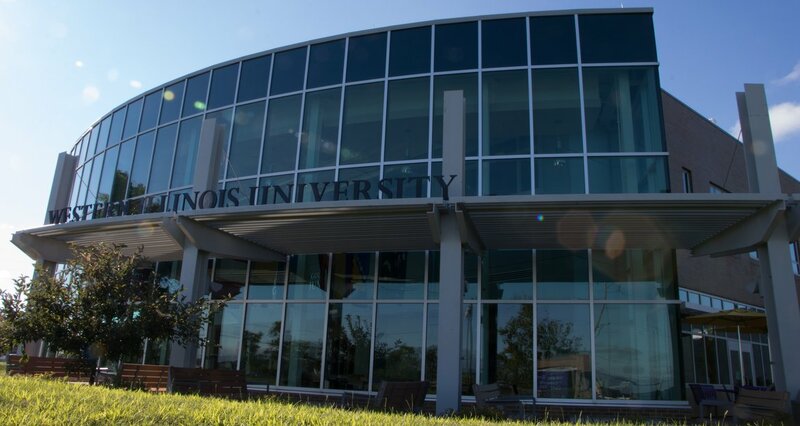 And before provincial business groups merged into the Quad Cities Chamber, the Illinois Quad City Chamber of Commerce was a proponent of a four-year pubic university in the community, and it commissioned a 2003 study that ultimately supported an expanded WIU presence here. Although the Quad Cities has long been rich in post-high-school educational opportunities – with private four-year colleges and community colleges on both sides of the river – the missing component was a full-service public university: an institution that could offer beginning-to-end bachelor and graduate degrees at a lower cost than private colleges. “This was the largest metropolitan area in the United States without access to a four-year [public] university, so there was clearly a need to build this campus,” Rives said. A key rationale for expanding WIU in the Quad Cities is the region’s relatively low percentage of people with college degrees. According to the U.S. Census, slightly less than 31 percent of people 25 and older in the Quad Cities metro region have a post-secondary degree. Nationally, more than 42 percent of people 25 and older have at least an associate’s degree. “I think any additional educational opportunities that we can provide for students in our area to keep them attending higher education ... is a good thing for our area and our community,” said Bettie Truitt, president of Black Hawk College. Downing and Barney both said WIU-QC is essential to meeting those higher-education goals, and they lauded the campus’ responsiveness to the local business community and its willingness to adapt. Downing added that the larger higher-education community in the Quad Cities has been addressing shifting education and workforce needs, such as “a need for more engineers – not only for John Deere but in our supply base and more broadly ... civil engineers and the construction trade. ... St. Ambrose was offering an industrial-engineering program at that time, but there wasn’t a broader engineering offering. And so it’s been great to see Western fill that gap ... .” She also noted that “St. Ambrose has enhanced their engineering presence and their engineering program,” and community colleges have made similar adjustments. Western Illinois University, of course, isn’t a new player in the Quad Cities. “Western’s delivered courses in the Quad Cities for over 100 years, but it was kind of a sleepy presence,” Rives said. A decade ago in the Quad Cities, he noted, Western was “primarily ... serving working adults – juniors, seniors, and graduate students – and it had about 18 different programs that it offered,” although it was not necessarily possible to complete all the coursework for the programs in the Quad Cities. Now WIU-QC offers 17 four-year majors, 20 graduate and doctoral degrees, and 13 certificates, all of which can be completed entirely at the Quad Cities campus. The campus budget (including only state appropriations and tuition) has increased from $7.1 million in Fiscal Year 2009 to roughly $10 million. The Leadership in Energy & Environmental Design silver-certified Building One of the campus opened in January 2012 (at a cost of more than $14 million) and houses the university’s College of Business & Technology – which includes the School of Engineering. The $42-million, three-building Phase II opened in 2014 and is home to the colleges of Arts & Sciences, Education & Human Services, and Fine Arts & Communication. The second phase, Rives said, was crucial – creating “a full campus presence to the community and to the region” and diversifying program offerings. But nearly $60 million in state construction has only modestly boosted enrollment – from 1,361 students in fall 2010 to 1,531 in fall 2015, an increase of 170. Yet underneath are clear indications that the campus’ student body is shifting toward what one might expect from a traditional four-year university – more full-time students, more underclassmen and undergraduates, and more students of traditional college age. • In 2008, only 30.1 percent of WIU-QC students were full-time; that figure was 42.7 percent in 2015. • In 2008, only 3.3 percent of WIU-QC students were freshmen and sophomores; that figure was 6.9 percent in 2015. The percentage of undergraduates increased from 49.3 percent to 66.6 percent over that same period. • In 2008, only 26.2 percent of students were under age 25; that figure was 37.1 percent in 2015. The percentage of students under age 30 increased from 52.7 percent percent to 58.1 percent over that same period. WIU-QC’s enrollment numbers also need to be considered within national and local trends in higher education. Since the campus plan was approved in 2006, a lot has happened. There was the Great Recession, which drove college attendance to record highs. According to the National Center for Educational Statistics, the number of people enrolled in degree-granting post-secondary education jumped from 17.8 million in 2006 to 21.0 million in 2010 – an increase of 18 percent. • Black Hawk College saw its enrollment decrease from 6,677 students in 2010 to 5,782 in 2014 – a drop of 13 percent. • Eastern Iowa Community College District had 9,365 students in 2010 and 8,143 in 2014 – a drop of 13 percent. • Kaplan University’s Davenport campus had 753 students in 2010 and 486 in 2014 – a drop of 35 percent. • Palmer College of Chiropractic had 1,253 students in 2010 and 986 in 2014 – a drop of 21 percent. Comparatively, the Quad Cities’ two private four-year schools fared well in terms in enrollment. • St. Ambrose University had 3,663 students in 2010 and 3,508 in 2014 – a drop of 4 percent. • Augustana College had 2,532 students in 2010 and 2,497 in 2014 – a drop of less than 2 percent. In that context, then, WIU-QC has done remarkably well, even considering the role the campus’ novelty likely played in bucking trends. Partnerships also extend to other educational institutions. Black Hawk College’s Truitt said Western’s increased Quad Cities presence has meant more opportunities for students to stay in the area. Rives said WIU-QC is dedicated to that ideal, citing as examples two “hybrid” master’s programs in business administration and college student personnel that were launched in 2015. Students complete 25 percent of their coursework on campus and the remainder online, and Rives said 94 percent of the programs’ seats were filled last fall. A third master’s hybrid program – in community and economic development – will begin this fall. “Each of the universities in the Quad Cities brings a local niche and market that we serve,” he said.